Madrid is simply the capital of European football. The Champions League final will be a derby. Atlético prevailed at Stamford Bridge with a 3-1 win against Chelsea by getting behind the defense of the Blues and opening the doors of the Londoner’s bus. It was clear after the 0-0 draw in the first leg that Chelsea had to win this home game. Nevertheless, José Mourinho’s lineup was very defensive. Branislav Ivanovic returned to the team from his yellow card suspension. The Serb took the pitch in his natural right-back position while the defensively strong César Azpilicueta moved forward one position. He was tasked with curtailing the strong combinations of Filipe Luís and man marked him in many phases. 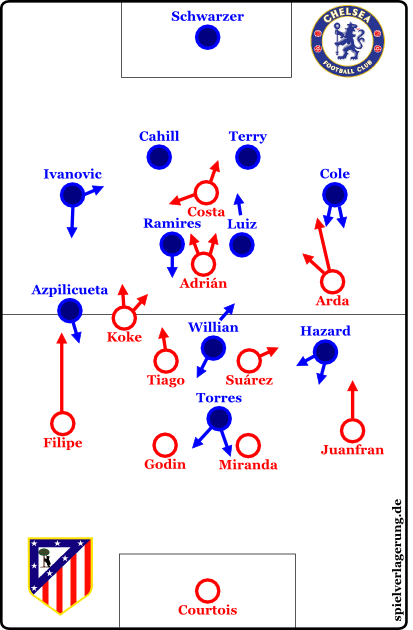 In Chelsea’s 4-2-3-1, Eden Hazard was used again as a proactive player on the left wing, while Willian nominally occupied the ten spot but often fell back into the half-space and acted on the same level as his compatriot Ramires, while the third Brazilian, David Luiz, remained central in front of the defensive line. For Atlético, Diego Simeone also had to rearrange his squad. Tiago started in place of the suspended captain Gabi and formed a double six with Mario Suárez. Arda Turan alternated between the two wing positions with his counterpart Koke. Raúl García had to make way for Adrián, who operated in the shadow of Diego Costa, and was the first destination for layoffs. In contrast to the first leg, the possession pendulum didn’t swing in any particular direction. Instead, both teams had balanced values and focused on stability. In the fifth minute, Atleti opened with a shot off the crossbar from Koke, but it wasn’t clear if he really meant to chip his shot over Mark Schwarzer into the far corner. Overall, it was easy to recognize many of Atlético’s well-known patterns. On the left side, Koke frequently moved into the Zehnerraum (ten space). In exchange, Diego Costa moved wide and, despite being isolated, was able to receive the ball a few times unchallenged. The movements of the attackers were most likely a reaction to the close tracking of Filipe by Azpilicueta. Chelsea’s shape was countered a bit by the overload of the wing. Ivanovic moved a bit narrower because Koke often searched for a way inside. Adrián or Costa would draw either the Serb or David Luiz wide and thereby open up the space again in the center. The guests found some combinations in these zones and there were smaller breakthroughs but nothing exploitable. The movements of the Spanish double six off the ball were especially interesting. The far-ball player stood a bit deeper to protect his partner from breakthroughs in the center. When Chelsea switched flanks, Tiago and Suárez would immediately change their vertical orientation, and the player near the ball would instantly have more momentum and could enter duels more intensely. In addition, the Aktionsradius of the central players was high. Tiago, Suárez or Koke could pick up some loose balls, draw fouls in tight situations, or be able to reach the center line again in possession of the ball and move immediately to the flank. A special commendation must be given again to Filipe, who employed a tremendous Spielintelligenz (game intelligence) and was outstanding again at pressing. Against the buildup of Chelsea, which took place mostly in a 2-3-2-3 with David Luiz as the central six but always tipping a little into the half-space, Atlético only attacked with the midfield press within their own half. Ramires often moved diagonally into the right half-space, trying to open up zones for Willian, so that he could act as a safe passing option. Hazard tried, especially when Fernando Torres moved to the wing, to reach the space between the lines. The basic formation of the Spaniards was just like in the first leg. The last row was wider than the narrow midfield band, partially to occupy and circumvent the main element with early vertical passes. For longer passes Chelsea took aim at the wider channel between the fullback and central defender, which was frequently penetrated by Torres. The attacker should, when he was between Miranda and Juan Fran, then claim the ball and find the diagonally incoming Hazard. The Belgian wanted to make a breakthrough with a tight dribbling move. Therefore, Atlético stood deep in their own half, and Suárez tried to follow the lively Hazard and restrict his actions. Finally, Chelsea took the lead via a through ball past Atlético’s defense. Azpilicueta was wide to the right side, while Willian came from left diagonally moved to the right and was found by Ivanovic. The Brazilian took the ball in stride but had his back to the field and was covered by Godin and Filipe. Willian, however, used a quick spin move to get through the small gap between them. Meanwhile, Azpilicueta was already running in front of him and cut the ball back to Torres for the goal. After this blow, it was time for Jose Mourinho to get the bus out of the garage. Chelsea were now deep in a 4-5-1. But unlike the first leg, Atlético was not too shallow in their offensive efforts to get behind the back line of the Londoners. Instead, they provided a perfect example of a goal against Chelsea’s deep-standing defense, although they were helped out by a tracking error. 44 minutes: Tiago penetrated the left offensive half space. The Portuguese man was not attacked, scanned the field and saw Juan Francisco start moving from his deeper position on the right side to the byline. Hazard had him in sight, but missed the start of his run. Juan Francisco laid the ball back across the goal and the three Englishmen in the six-yard box failed to clear the ball. Ashley Cole even pulled back to avoid an own goal. Adrián hit the bouncing ball into the ground and into Schwarzer’s net. Atletico’s equalizes. Tiago is only slightly marked by Ramires. Juan Francisco takes off with pace to the byline and lays it across to Adrián. And so it went in a balanced game (54 to 46 percent possessionl, 5 to 4 Shots) with a balanced result in the first half. But the often-touted momentum was apparently with the guests, because after the intermission the Merengues were quite brisk on the field. Koke was now constantly on the right side, while Diego Costa and Adrián also swapped spots so that Koke and Costa could overload the right side. A ball into the box landed by Arda, who worked from a tight angle to get a clear shot but failed to beat Schwarzer. But Chelsea needed a goal to reach the finals. Therefore, Mourinho unceremoniously brought Samuel Eto’o on for Ashley Cole. Chelsea’s formation was transformed into a 4-4-2. Azpilicueta took over the position of left-back, Willian moved out to the right side. Eto’o turned the tide in favor of Atletico. After a sliced shot into the edge of the Chelsea penalty area, Eto’o went to pry the ball away. However, Diego Costa crossed his path and was touched by the Cameroonian. The penalty was awarded and after what seemed like an eternity of the ball rolling off the penalty spot Costa stepped up and roofed his shot into the top net. Afterwards, Atlético went into deep 4-5 1 mode. Adrián, who was later replaced by Raúl García, positioned himself to the right while Koke acted as the inside-right eight. Mourinho took his counter striker Torres off the field and brought on his target player Demba Ba. In this phase, David Luiz put a free kick by Willian off the post. But, before any doubt could creep in, the Merengues sealed the game with a goal very similar to the 1-1. This time, Tiago played in a more open situation from the left half-space to the on-rushing Juan Francisco, who Hazard could only watch run past. Juan Francisco laid the ball back across goal as Arda Turan pulled inside and headed the ball off the post. The rebound fell to the Turk and he made it 1:3. Game over. When Chelsea had to open the space in the second half, Atlético became increasingly more powerful and dangerous. Both teams spent a long time in the Abtastphase (a time period where both teams are trying to figure each other out), which was understandable given the midfield pressing of both teams. Many ball battles played out in the midfield. The Londoners had to act openly and use more players in the transition from defense to attack. Mourinho’s side was also fairly dangerous until the opening goal. Torres’s movements and ball handling were a constant source of unrest. After taking the lead, the Blues parked the bus, but Atlético had agreed a good remedy for their deep 4-5-1 formation: Long diagonal ball and layoffs. It worked in the second half again, from an even more open position. Thus the rojiblancos are in the final of this year’s Champions League and face their city rivals Real Madrid. Thanks to @rafamufc, who translated this piece for us!